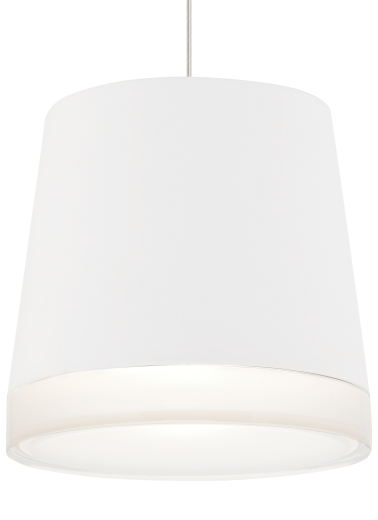 This pendant has a classic yet modern appeal. The upper body is crafted from spun metal hand-painted with rubberized enamel for a soft, matte finish which is then combined with a beautifully hand-polished, premium pressed glass shade. Includes 120 volt, 75 watt medium base A21 lamp or G24Q-3 base 32w triple tube compact fluorescent lamp (electronic ballast included). LED version ships with one 120V, 19 watt A21 Philips LED lamp. Incandescent version dimmable with standard incandescent dimmer. LED version dimmable with an LED compatible dimmer. Fixture provided with six feet of field-cuttable cable. Available in black, satin nickel or white finish.